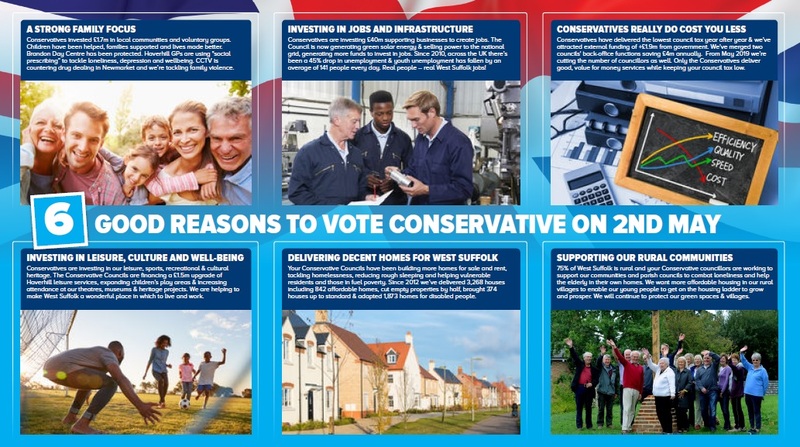 West Suffolk local Conservatives launched our election campaign in Haverhill on Saturday 13th April to win a majority on West Suffolk Council on 2nd May 2019. 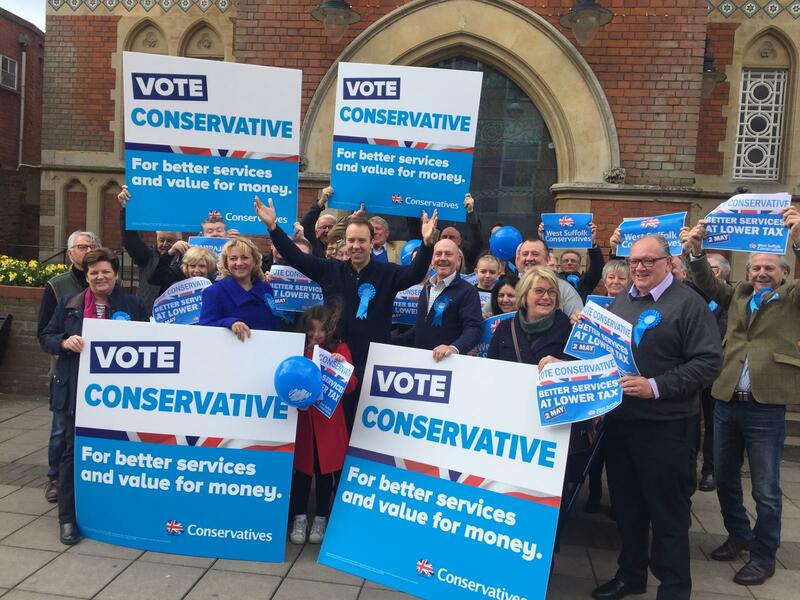 We were joined by our candidates from across West Suffolk and our MP Matt Hancock. Local Conservative have controlled the administrations for both Forest Heath District and St. Edmundsbury Borough Councils, which will be joining together in May 2019 to form the new West Suffolk Council. This manifesto sets out below our achievements in recent years and our pledges for administration. We have invested £5.1m in initiatives in 2017/18 to create and attract jobs, support business and manage growth. Opened the Eastern Relief Road in Bury St Edmunds in September 2017 which opened up 68 hectares of employment land, a secondary school with leisure facility and land for 500 new homes. Led the process of future planning of West Suffolk’s towns, villages and rural areas, including through masterplans that aim to balance the need for growth in jobs and housing with the need to preserve our countryside and heritage. Supported 50 businesses to achieve the Trading Standards Eat Out Eat Well award. Make our use of public buildings and land more efficient and better for customers through the development of the Mildenhall Hub and Phase 2 of the Public Service Village at Western Way, Bury St Edmunds. Provided support to local communities, voluntary groups, organisations and small businesses with over £1,706,718 of grants. Set up a social prescribing pilot in Haverhill which aims to combat the high percentage of GP appointments which are for social needs rather than medical. Helped establish the Bury Drop In by connecting community groups with agencies and charities. Worked with partners to prevent the closure of the Brandon Day Centre in 2016. Supported volunteers to make ‘The Shed’ in West Row a community garden with a kitchen, meeting rooms and storage facilities. Tackle cases of anti-social behaviour and address issues related to community safety such as County Lines, Violence Against Women and Girls, Men and Boys, Prevent and Hate Crime. Support the development of the Mildenhall Hub to provide benefit to the community from the co-location of schools, leisure centre and swimming pool and look for other opportunities across the area. Work with the community to facilitate an upgrade to the Moreton Hall Community Centre, including provision of a new public library point, and transfer the asset into community ownership. We have delivered 842 affordable homes in the past 5 years. Brought 374 properties up to standard, through grants over the lifetime of the Housing Strategy (2015-2018). Secured £607,994 from government to reduce rough sleeping and actively assisted or prevented some 500 households across West Suffolk, from becoming homeless in 2017. Established a Winter Night Shelter in 2017 to provide accommodation for rough sleepers over the winter months, with extra provision now in place all year round. Build more for homes for sale and rent across West Suffolk through our own housebuilding company. Continue to tackle homelessness and reduce rough sleeping, in line with the Government’s target of eliminating rough sleeping by 2027 and halving by 2022. Increase the range and number of housing options available so that we can respond to and plan for the growing need for additional housing. Help vulnerable residents and those in fuel poverty by securing affordable warmth for households and communities. Provide support, encouragement and funding to help owners of empty homes bring them back into use. Facilitated the Love Where You Live campaign which inspired 3,733 people to collect 1,354 sacks of litter. Removed 70 abandoned vehicles and successfully prosecuted 11 cases. Achieved the Park Mark award for all West Suffolk car parks. Installed contactless card payments and Apply pay in 25 car park machines. We also saw an 88% rise in transactions by credit card from 2016 to 2017. Purchased Brandon Country Park as an added asset to enhance for the community. Purchased the former Post Office and DHL buildings in Bury St Edmunds as part of our long term investment plan to help generate income and support the future delivery of public services. Provide safe, high quality and adequate levels of parking across West Suffolk, and respond to changing technology and user requirements. Manage, maintain and invest in our public buildings, the Council’s industrial, commercial and retail estate, and CCTV network that will maximise financial return and support the economic and social wellbeing of our residents and businesses. Develop our commercial offer to local businesses and organisations to increase income to offset the cost of council services. Maintain the quality of public space through efficient household waste collections and an effective programme of street cleansing. Invested in our leisure centres, children’s play areas and Home of Horseracing Museum (Newmarket), which was awarded Suffolk Museum of the Year. Gained Green Flag status for five West Suffolk parks in 2018. Increased ticket sales at the apex by 6% between 2016-17 and 2017-18, and increased box office receipts by 27% between 2015 and 2017, thereby reducing costs to the taxpayer. Installed 5km walk/run routes in West Suffolk Parks. Formed the Abbey of St Edmund Heritage Partnership in Bury St Edmunds. We are investing £1.5 million in upgrading leisure facilities in Haverhill. Invest in our leisure centres to include, where appropriate, co-location with health services to support individuals to increase levels of physical activity and to ensure that by 2024, leisure centres require no council subsidy. Continue to support and promote activities which encourage individuals and communities to keep active and healthy. Maintain and enhance our parks and public open spaces for both the current and future generations. Ensure that our venues and facilities remain well used and provide a broad range of events and activities for the communities they serve. Ensure that we stimulate and maintain interest in the heritage of our area by promoting and supporting associated initiatives and venues. Continued to protect services and kept our council tax frozen despite an 81% reduction to our grants over the past 5 years. Because we’re an efficient authority we’ve attracted external funding grants of over £44,000 and capital funding of over £1.9 million pounds. Generated 11,682MWh of electricity through our solar farm in 2017/18 bringing in £308,000 of net income to contribute towards funding local services. We have acquired properties in Haverhill, Mildenhall, Bury St. Edmunds and elsewhere to sustain communities and bring in rental income to support our services. Welcomed 16 interns and 51 apprentices working across the organisation. Four out of five apprentices in the last year have continued working with us. Introduced a Mental Health at Work policy in 2016 and signed up to the Time to Change Employers pledge in 2017. The pledge represents a commitment to support staff, increase awareness, initiate actions to prevent and manage issues and support managers to help support their staff to stay well and in work. Established a shared legal service with two other councils, uniting the services using our existing budget and used no new additional funding. Continue to maintain the financial resilience of the council in challenging times, through strong management, a continued drive to make savings and efficiencies and robust investment decisions.